The Christmas that Judson and I were engaged (2011), we gave everyone we knew homemade Christmas gifts. For the most part, these gifts took the form of festively-decorated jars full of peanut butter balls, bourbon balls, buttercream truffles and peppermint bark, all made in huge batches in my tiny flat's kitchen over the preceding weeks. 'True, but where would I get the bourbon?' I said without thinking, since bourbon here is way more expensive than stateside. But then when I started thinking about it, I realised that the truth is I can't stomach the idea of bourbon balls just yet. Homemade peanut butter balls, though? These are given an exemption because they're basically higher-quality Reese's Cups, which, as we've discussed, are my favourite candy. And this recipe, with the exception of the Rice Krispies involved, is exactly how they should be made. The recipe, with the exception of 'one box of powdered sugar,' is possibly the most concise recipe I've found in the Recipe Box to date. One 'box' of powdered sugar, though? Really? I did some googling- you know, standard Google searches like 'how many ounces in a standard size box of powdered sugar in 1975', and between those results and my own best estimations, figured it out pretty easily. The Rice Krispies, honestly, are not really necessary- I think I prefer my peanut butter candy without them (an added bonus: without the Rice Krispies, these are gluten-free), but adding the Rice Krispies definitely helps stretch the batch to be a little bigger, and keeps the candies from being quite as rich as they otherwise would be. If your chocolate gets too warm, it will puddle in a 'foot' around the base of the candy. Keep an eye on your finished candies as you go and if you notice this happening, turn down the heat or turn it off temporarily to allow it to cool off. Made as per the below WITH Rice Krispies, you'll have approximately 50 balls. WITHOUT Rice Krispies, plan for about 40. Recipe can easily be doubled to make 80-100 balls. Balls will keep for 2 weeks in the fridge or 4 days at room temperature. As for the peanut brittle... well, it was really tasty. Weirdly, there are two recipes for this exact peanut brittle in the box, one hand-written and one typed, both clearly well used. Technically, it should have been made with 'raw spanish peanuts,' but, as ever, when it comes to nuts my supermarket is always foiling me, so mine was instead made with pecans, back when I could find pecans in my supermarket. I made it without a candy thermometer (I used my meat thermometer instead like some kind of heathen) and it came out just right anyway. Except for the fact that my tin wasn't big enough and so the molten brittle was so deep in the pan that the finished product was practically impossible to break. I'm including directions below for a half-batch of what I made, so that you can use a standard 11x13 pan to pour it into. I strongly recommend using a single pan for this recipe and not trying to split the molten brittle into different pans, as you'll inevitably end up with all the nuts in one pan and the other pan full of only praline. The pictures included here are of my far-too-thick version, so yours will be roughly half this thickness. Measure and prepare ALL ingredients and equipment before you begin. Lock any animals or small children or distracting husbands out of the kitchen before you start- this recipe requires no distractions and can't really be 'paused' in the middle. Plus, the molten caramel is really hot and if it spills or splashes, will really hurt. This can be adjusted with other flavourings as you wish: pecans, almonds or hazelnuts work just as well as peanuts, or go the Italian route and make it with pine nuts. You can also add other herbal/spice flavours by blending them with the sugar before you begin or sprinkling them in at the end (I really love a few spoonfuls of minced rosemary, muddled with the sugar or sprinkled in at the end, but cinnamon, ginger, or nutmeg are all also lovely, as is a heaping pinch of smoked salt sprinkled on after the mixture is poured into the pan). 5 spoons out of five. These are easy, delicious and have far fewer preservatives in them than store-bought candy. Pretty much they are the perfect addition to your holiday dessert collection, and, if nothing else, you should make a batch for yourself and keep them in the fridge for stressful moments over the next week. 4 spoons out of five. Knocking off a spoon because candy making is a bit of a faff and the cleanup is a nightmare- prepare for your counter to be covered in hardened caramel anywhere you set your mixing spoon, pan or prep dish. But as long as you follow the directions below so that your brittle is more brittle and less brick, you'll be good to go. Melt butter and peanut butter together and pour into mixing bowl. If adding Rice Krispies, fold them in gently until well-blended. Chill at least 1 hour until very cold. Shape into balls between 1/2-inch and 1-inch wide. (I prefer smaller candies so there is a more even balance of chocolate and peanut butter, but you can make them as big or small as you please, and they do not have to be even since you're not baking them). Chill balls until ready to use. Place a large sheet of parchment or waxed paper near your double-boiler. Melt chocolate in a double boiler over very low heat. 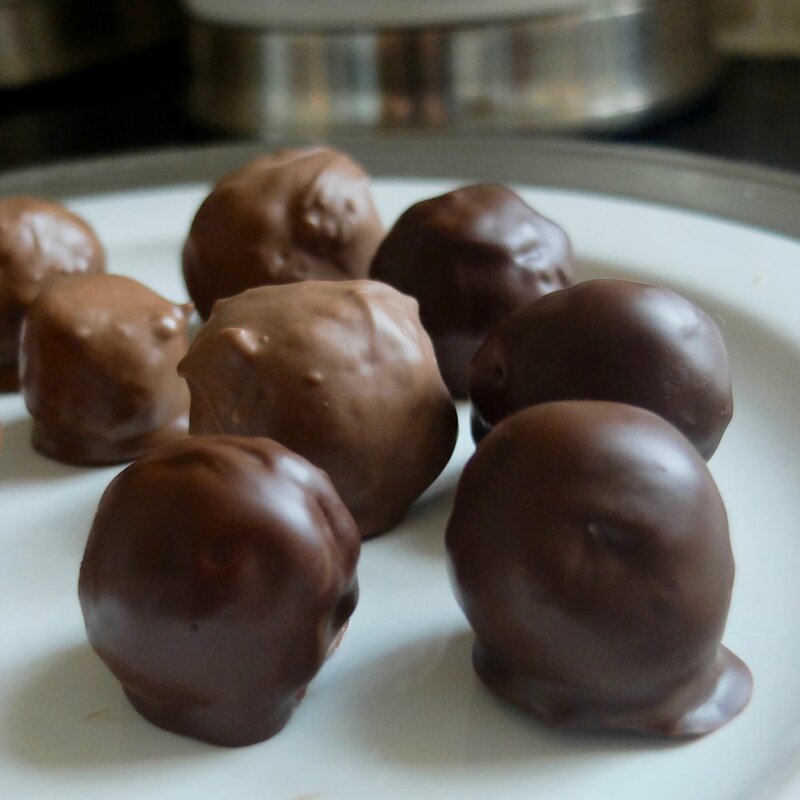 One at a time, drop chilled balls into chocolate, flip over with a fork until completely covered. Lift the ball out on the fork, scraping off any excess on the edge of the pot. Place the coated ball on the parchment paper and continue with remaining balls. Butter an 11x13 tin very heavily, especially in the corners. If you do not have a candy thermometer, place a bowl of VERY cold water next to the stove with a small teaspoon for testing the temperature. 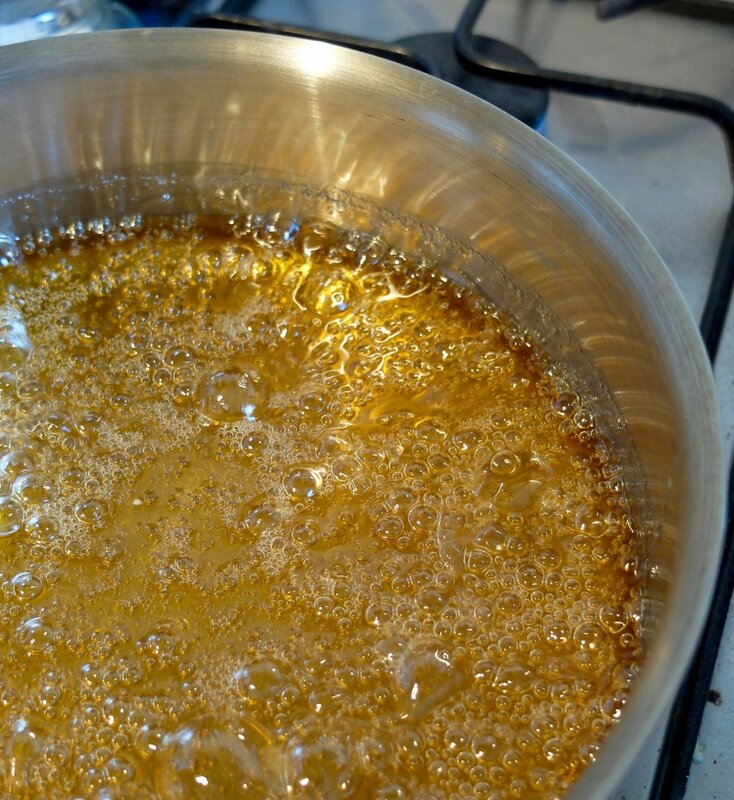 Combine sugar, golden syrup or corn syrup and water. Add nuts and continue cooking until mixture is very golden brown and hits 295-300 on a candy thermometer (approx. 5 more minutes without a candy thermometer). Remove from heat and add butter, baking soda and salt. Stir well and quickly (baking soda will make mixture 'foam'). IMMEDIATELY pour into prepared tin, using your mixing spoon to even out the top. Allow to cool completely before using the flat side of a meat tenderiser to shatter the brittle. Store in a very tightly sealed container at room temperature; best served within a day or two in case it gets humid and sticky, but can be stored up to a week. *This occurs when a very small amount of the mixture, dropped from a small spoon into the bowl of cold water, creates very thin threads behind it as it falls into the water.